My entry in this compo. The options are ship parts which when charged up combine with the player ship shield it and provide (temporary) awesome firepower. The level of firepower increases as you collect more. You can collect a wing silhouette, nose silhouette and tail silhouette. Silhouettes provide protection by absorbing enemy fire. They're also critical for a high score. Each bullet they absorb increases a multiplier by one. When you score (by killing an enemy for example) it's multiplied by the multiplier. If you're not using the silhouettes to absorb bullets for a while the multiplier decreases back to one. 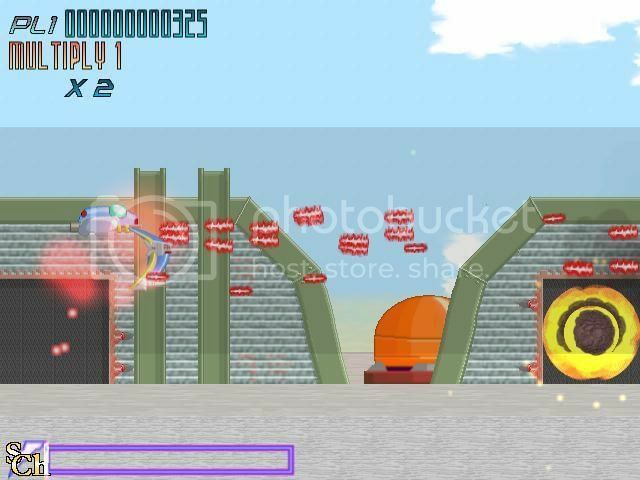 During mega absorbing a bullet will add the value of the multiplier to your score. I'm doing it using HGE and C/C++. All artwork is by me. Sound effects from trolling free sound websites. Look out for ships carrying red containers and red boxes. These hold goodies for you! I can't wait to play this, along with all the other entries. • So You Want To Be A Pixel Artist? And welcome to the competition, by the way!!! ! I spent all of 5 seconds per sprite there (with the exception of the gauge on the bottom) and it definately shows. I have yet to decide what sort of style to go for... I might colour some hand drawn art in GIMP or I might model and render everything. I'll probibly go for the scanning since I used rendering for my other projects. I'm working on enemies at the moment I'm almost ready to move on to doing the event system. I'll post more screenies once the event system up and running. I've now got most of the foundation stuff done e.g. bullet system, events, and such. Still lots left for code. LOL will do but only if I can watch your Bobobo DVD while I'm there. On your updated screenshots so far, HunchedWarrior, it seems to me that you have improved the artwork of the player’s ship, which is a very good start here in terms of the graphics. As for the rest of the development of this game, I wish you the best of excellent success with it, ok now? =b ! A base score is awarded from how tough an enemy is plus five points, for instance an enemy that takes 5 hits is worth 10 points (5 base + 5 hits.) This is then multiplied by the bonus multiplier. 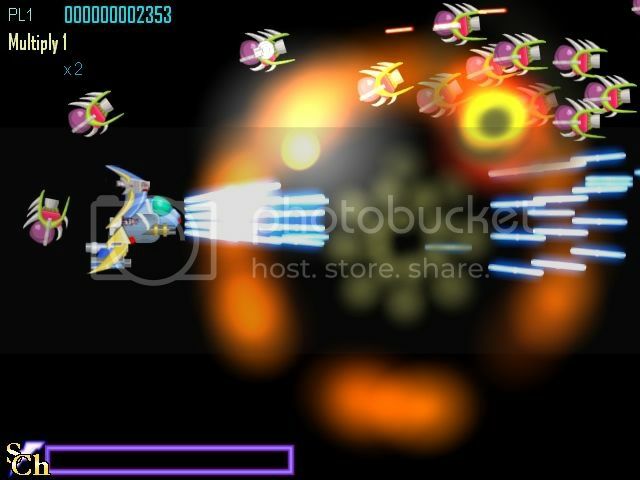 To increase the multiplier you absorb bullets with the silhouettes. If you're not absorbing bullets the multiplier steadily decreases back to 1. The longer you take to absorb another bullet the faster the multiplier decreases. In addition when you charge up and use the mega shot ability any bullets that hit in this state give you points equal to the value of the multiplier. If you time it right you can get lots and lots of points. I'm trying to encourage the player to keep enemies alive and shooting if they want to maximize their score but at the same time they won't lose their bonus entirely if they play conservatively in a hard section. Also I'm trying to encourage the player to take risks by engaging bullet patterns close up if they want a high score. Sounds like a good plan, you've definately got the elements of risk verses reward in there. Like with all things, how it works in the end comes down to balancing but this is definately a good start. It's really good to see people putting the extra effort into scoring mechanics, in my opinion these can really be the cherry on the cakes for a lot of shmups. I've got a decent little test stage... though the game doesn't end on stage completion (coding that in now.) 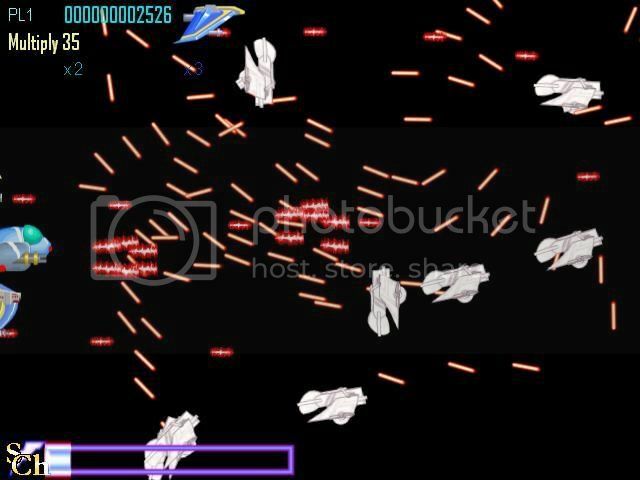 It's a mix of fighters and larger ships spewing shots in your general direction and smaller "kamikazi" drones that can very quickly clog up the screen. Unfortunately it's highlighted a minor issue with my bullet/particle system in that with the number of guns and effects I'm hoping to have onscreen the game quickly consumes the maximum number of bullet/particle systems that can be active at one time causing the game to error out. On a happier note the multiplier system is proving to be at least moderatly fun. 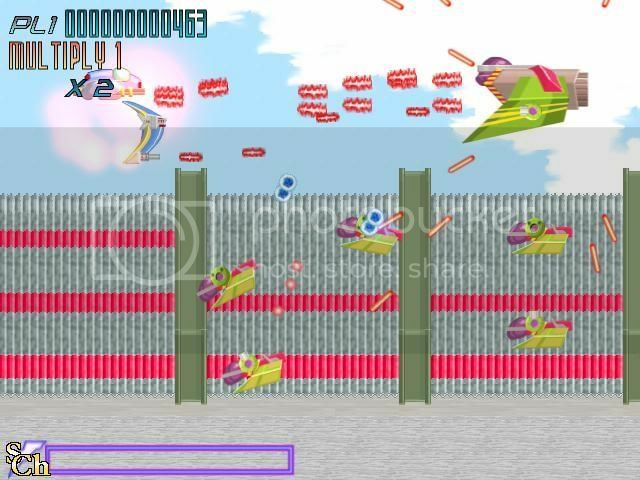 Relatively early in the stage these fighters show up and loop around the screen firing quick bursts of 3 bullets. Good placement of the wing silhouette is required to protect against the gunship that appears later. Later in the stage this large swarm of drones tries to kill you through sheer weight of numbers. 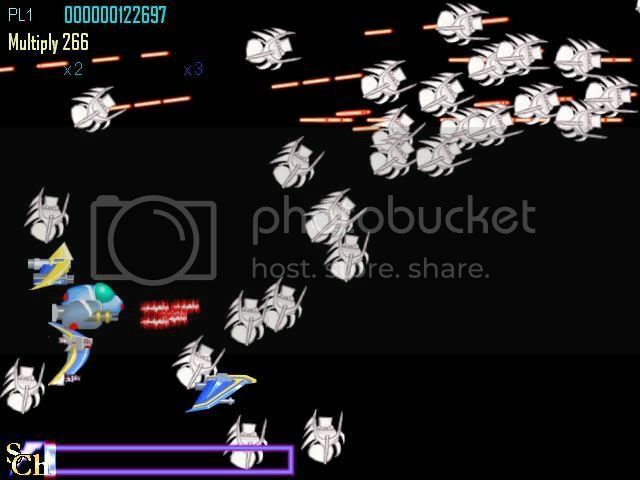 You can use the mega here but you sacrifice the points to be collected from the gunships that appear after this swarm which fire dense clumps of bullets that can give massive points during mega mode. All of the enemy artwork will recieve the same treatment as the player, they're currently just scans from my sketchbook. This game is coming along great. Are the drones arachnoid? Working on the bullet system today and adding limited lives and the underlying crap for powering up. I'm adapting the bullet pattern system to also double as the particle system (so I can do cooler effects than the ones I can do with HGE's system.) Particles will simply be bullets that can't do damage. Also bullets will be able to do a lot more like change colours and scale as they move to support some of the effects I hope to do. After seeing some of the competition I want to be sure to have adaquite eye candy. Hopefully I can finish a demo by the end of this week. I can't guarentee the eye-candy level it will have though. My new job has been getting in the way of me working on the game (didn't get anything done on Sunday due to a family trip, then nothing on Monday due to work and school related crap.) So I'll post a screenshot showing the particle system, (just stub particle images) and the blue gun in use. I still have artwork for a couple enemies to do and hopefully the animation system before releasing the first demo. Starting to come together now . With some nice backgrounds, this could look pretty nice. I'm looking forward to the demo. I decided to change the way the silhouettes behave a little to make things more interesting. When you first collect them they'll orbit your fighter. If you press their "sentry" button then they'll keep orbiting in place instead of following you so you can have a convenient shield between you and some bullet spewing group of enemies. Pressing "sentry" again will call the silhouette back. Each one can be individually controlled. Also I decided to can having bombs since the dynamic of sentrying/unsentrying/combining with the silhouettes is IMO far more interesting then simple panic bombing. You've really made progress with the graphics! BTW, I agree with you about the bomb issue. The first demo is out now! It's attached to the first post. Hope you guys like it. Collect different coloured "P" icons to change weapons. Collect one of the same colour to power up. Well, then you'd have to have it fire without pressing anything, because the same button is used for the mega shot. Anyway, looks nice. The logo and menu seem very familiar... Xwars maybe? Mega Shot? Then he should have a second button, maybe X, for it. But that's just my personal opinion. I should have bothered to read the instructions. Having multiple functionalities mapped to a single button is one way to add variation and challenge to a game, since you have to be focused while thinking about when to tap and when to hold. The arcade version of Mars Matrix had only a single button, with 3 functionalities mapped to it. Other popular examples include GigaWing and Border Down. I know that, I just don't like having to mash the same button repeatedly to get a barrage going. It's very annoying to me. Ermm. I'm sorry Shoot-em-upper but I think there's been a mis-understanding here. You were never made a judge. Even if you were you shouldn't be using that as leverage to try and get people to conform with your opinions. I'll pm you. Also on the subject on multi-functioning buttons and auto-fire its possible to create a half way solution as seen in many commercial games such as mushi and gigawing. The way this works is that tapping the button once will give you a short burst of auto-fire thus reducing strain from button tapping since you dont have to tap as frequently. As long as you tap again before the burst finishes then you can keep a continuous stream going. Holding the same button however will activate the second feature. Gigawing and Mar Matrix even took this one step further by giving you different auto-fire rates or fire modes depending on how fast you tapped. Personally I tend to prefer multi-functioning buttons to having seperate buttons for eveything but that's just my opinion. I find its just more intuitive and prevents those "oh arse I just died cause I got the buttons mixed up" moments. I am drawing at least some inspiration from GigaWing. The charge/fire behavior is drawn from GigaWing's fire/reflect. I REALLY want to have one of those huge Capcom laser beams with the spirals in my game . The S/Ch logo by silhouette charge bar? Any suggestions/criticism for the scoring of the game & control of the silhouettes? The first stage of the game will be similar to this demo though probably longer. It will also probibly only have one silhouette in it. One other question. Which do you guys prefer, having powerups of each colour appearing one after another (how it is currently) or having the powerup cycle through its colours continuously until collected (like in 19XX?) In either case you need to collect a powerup of the same colour as your weapon to power it up. A suggestion: maybe make it so that as soon as you kill an enemy that drops a silhouette, you have to get the silhouette before it starts shooting (It currently instantly works when the enemy drops it). Regarding your last question, how many power up types are there? I know of red and blue, is that all there is? 2nd question: Three; red, green and blue. The test stage was a bit too short to justify having all three. Red scatters shots, blue fires more predictable (and larger) spreads and green fires penetrating blasts, like in Kill the Things. I figured as much. Typical of you to have 3 different weapon types. I like how it currently is for powerups, but thats my preference. Building a nice little stage editor for the game at the moment. I'm mainly spending the time on this because of the fact that a lot of the stuff I want to do is rather awkward without some sort of visual preview. (thus the bizarre movement of the enemy fighters for example.) Lots of coding, not much in the way of exciting screenshots. It's progressing well however. I've already got it so I can set up particles, enemies and paths with it. I should have bullet patterns and events done some time this week and hopefully backgrounds this weekend. Looks like I'm not a judge. Oh, well, I like your control setup idea. I (finally) have backgrounds working! I ended up spending a bunch of time making an editor so I could build maps relatively easily, that's all done now Work's been seriously getting in the way of my development time. I did change the weapons a bit so auto-fire will provide a consistent stream of bullets. I'll post a screenshot after I have some decent artwork. I did change the weapons a bit so auto-fire will provide a consistent stream of bullets. The final version (for the compttition) is up, hopefully you all like it. It was definately an interesting weekend getting this all done. It's been fun. If I have time maybe I'll enter in another one. If school doesn't get too much in the way I'll do a postmortem this week. School is a bear with RTOS and other fun but tough courses.